Let's see how we can get Optimizing Customer Experiences or how can do A/B or Multivariate tests by Google Analytics Video Guide. Metrics life cycle process is your friend! 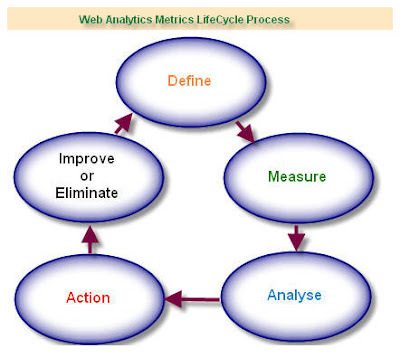 Kaushik my favorite Web analytics expert has described Four Attributes of Great Metrics and metrics life cycle process. He says "Metrics life cycle process is your friend!". if you are using web analytics and want to improve your online presence of website, you need to know the life-cycle process of metrics we need to care during web performance management and before planning or making a strategy to implement in online activities. Let's see a an graphic demo of Analytics Metrics Lifecycle Process suggested by Kaushik. If you look at the image carefully, each circle describe its own definition itself to care about for each step whenever you want to start or implement analytics process. According to him you and every web analytics user should execute the Metrics Life cycle Process in a timely manner, atleast once a quarter. Last day I found new features in Analytics Dashboard that have been released within Google Analytics. Google has announced new graphics tools and supported new six languages: Thai, Filipino, Indonesian, Czech, Hungarian, and Portuguese (Portugal). Now you can select any one of the 25 Google Analytics supported languages. Pulldown Language menu on the Analytics Settings-->My Account page and select language which you prefer or understand. Google Analytics is trying to more effective and easy interaction for its users. By adding graphics features, language supports, tracking features makes its better than other web analytics softwares and application. Additionally, a new feature added in google analytics is ga.js tags that allow you to track e-commerce transactions in a more readable way. If you are using Google Analytics to track your website traffic you need to update your tracking code installed in website pages by following a simple instruction. If you are ready to update tracking code go -> Analytics Settings >> Profile Settings >> Tracking Code (Check Status - Edit). Copy New Tracking Code (ga.js) and replace with old tracking code. If you want to know about your visitors location, where they came from? By Google Analytics you can help you to know about visitors location. Location may be City, Country, Territory, Sub Continent Region or Continent. I have already described a Visitor Segmentation Overview, now I am trying to guide you about visitor location they may very much help you to track and target you visitors and make a different business or any strategy that you never plan. But in this post I will not describe much about traffic or visitor source because we want to know about how to track visitor location in Google web analytics. Follow some simple steps to track visitor location report. Click on Visitors in left menu panel. After Drop down click on Map Overlay. See right side panel on dashboard you will get a world map with different colors. When you will put mouse cursor on map you will find a pop image with visits and location name. Below the map you will get a table of listed countries and territories, your vistor,s location. If you want to know about cities of a particular country you will have to click or select one a country. Next report will be name of city location with no. of visits. 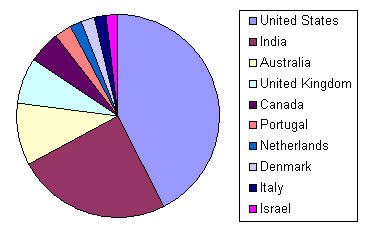 For example I am sharing my top 10 visitor's location, from where they came to my blog. Buy using report of Visitor Location you can change your plans if you are getting non related visitors or you can make a strong strategy also if you are getting related and targeted visitors and visitor location.